This past Thursday was Australia Day, and since I was owed a time-in-lieu day at work, my partner and I took Friday off and made a long weekend out of it, traveling up the coast to Port Stephens for a little holiday. It may be the last one we take, just the two of us, for a while! We had some really lovely weather, and a great view of the beach from the house we rented. Jim taught me how to snorkel and we did a lot of hiking in search of wild koalas – eventually finding three of them in a habitat along the coast of Tanilba Bay. It made me feel so lucky that we’ll be raising Pickle in an area where you don’t have to travel very far to see such natural beauty. We hit a little snag in the road on Friday though when we took a spontaneous walk through the bush off the walking path we’d been on, hoping we’d be more likely to spot some fauna. Unfortunately the fauna we encountered was not of the cute fuzzy kind. Not being able to tell straightaway this wasn’t a spider, I had visions of being whisked to the ER and having my foot amputated. The throbbing spreading up to my ankle supported this conclusion. And then of course, the worse thoughts started coming… Did I just poison my baby? Am I going to miscarry? All these thoughts raced through my mind as tears streamed down my face and Jim got me back to our car, and to an area with phone signal. My toe wasn’t swollen or discoloured – just in a lot of pain, so he called Poison Control. Luckily a very nice lady calmed us down and assured us I’d not been poisoned, but that these ants simply inject you with a painful acid, and most relieving, that the toxins could not pass through the placenta. She suggested we disinfect the area (which we did, thanks to our trusty first aid kit) and go see a chemist to see if there were an antihistamines I could take while pregnant. We went to the chemist who simply recommended Panadol to dull the pain. I decided to skip it though, and just take the pain, which thankfully only lasted a few hours. It was over very quickly, but I couldn’t help shake that feeling of guilt. This was my first big parenting scare. Something careless that I did could have harmed my baby. I am fully responsbile for this tiny human’s welfare now. It’s a scary thought. The comfort is in knowing that we reacted appropriately in the face of danger. We acted quickly, called the right people, and were prepared with first-aid. I’m going to sign up for a children’s First Aid course soon as well, something that’s been on my to-do list for a while. The best I can really do is try to prepare myself as best I can for life’s unanticipated ant stings. I came here via Offbeat Mama, and the first post I see is a trip to Tanilba Bay – where my in-laws live! Sweet blog, and congrats on your wee Pickle. Oh, awesome! Ant stongs aside, we loved Tanilba Bay! 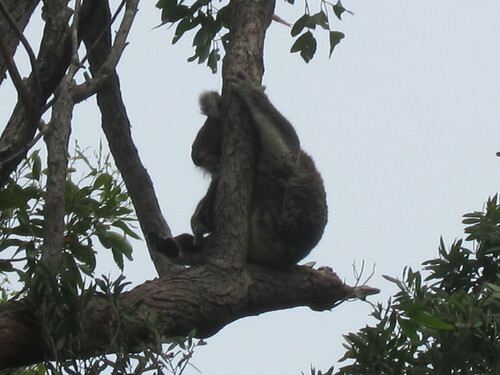 Such a beautiful area, and my first chance to see koalas in their natural habitat.